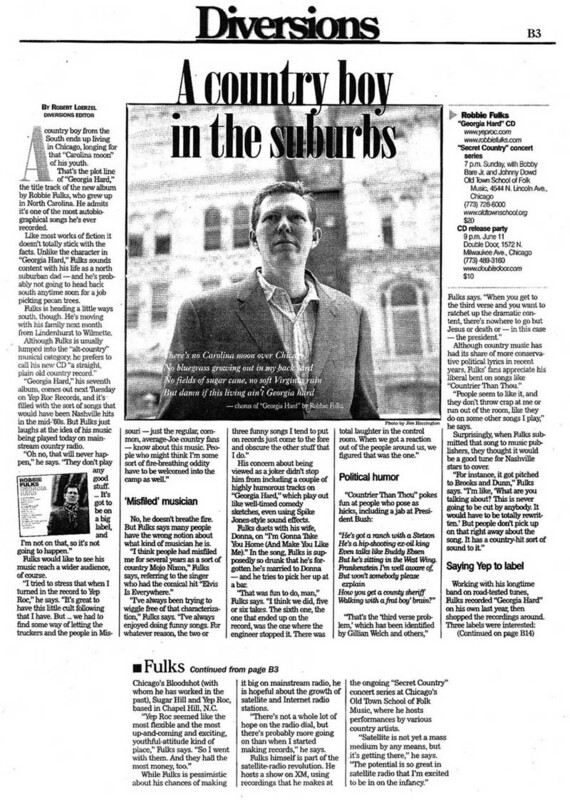 This article by Robert Loerzel originally appeared in Pioneer Press on May 12, 2005. A country boy from the South ends up living in Chicago, longing for that “Carolina moon” of his youth. That’s the plot line of “Georgia Hard,” the title track of the new album by Robbie Fulks, who grew up in North Carolina. He admits it’s one of the most autobiographical songs he’s ever recorded. Like most works of fiction it doesn’t totally stick with the facts. Unlike the character in “Georgia Hard,” Fulks sounds content with his life as a north suburban dad — and he’s probably not going to head back south anytime soon for a job picking pecan trees. Fulks is heading a little ways south, though. He’s moving with his family next month from Lindenhurst to Wilmette. “Georgia Hard,” his seventh album, comes out next Tuesday on Yep Roc Records, and it’s filled with the sort of songs that would have been Nashville hits in the mid-’60s. But Fulks just laughs at the idea of his music being played today on mainstream country radio. Fulks would like to see his music reach a wider audience, of course. No, he doesn’t breathe fire. But Fulks says many people have the wrong notion about what kind of musician he is. His concern about being viewed as a joker didn’t stop him from including a couple of highly humorous tracks on “Georgia Hard,” which play out like well-timed comedy sketches, even using Spike Jones-style sound effects. Fulks duets with his wife, Donna, on “I’m Gonna Take You Home (And Make You Like Me).” In the song, Fulks is supposedly so drunk that he’s forgotten he’s married to Donna — and he tries to pick her up at a bar. But he’s sitting in the West Wing. “People seem to like it, and they don’t throw crap at me or run out of the room, like they do on some other songs I play,” he says. Surprisingly, when Fulks submitted that song to music publishers, they thought it would be a good tune for Nashville stars to cover. Working with his longtime band on road-tested tunes, Fulks recorded “Georgia Hard” on his own last year, then shopped the recordings around. Three labels were interested: Chicago’s Bloodshot (with whom he has worked in the past), Sugar Hill and Yep Roc, based in Chapel Hill, N.C. While Fulks is pessimistic about his chances of making it big on mainstream radio, he is hopeful about the growth of satellite and Internet radio stations. “There’s not a whole lot of hope on the radio dial, but there’s probably more going on than when I started making records,” he says. Fulks himself is part of the satellite-radio revolution. He hosts a show on XM, using recordings that he makes at the ongoing ‘‘Secret Country” concert series at Chicago’s Old Town School of Folk Music, where he hosts performances by various country artists.